Gone are the days of progressive glory (hehehe, I made a funny), now we have arena rock to make us feel warm at night. Is this someone else's fantasy? It would have to be. I'd never dream of Styx (who are what... the fourth generation of arena rock rip offs, now?) Well, at least they make a grand effort here, but to me, it still seems to be an illusion. Styx just cant be this good! That is to say, this is completely average and mediocre hard rock, without an ounce of real soul or progression. But it is good soulless power rock. And at least the lyrics aren't terrible. Actually, they are nice, at times. Even on the obvious Commercial attack of Grand illusion. They rock pretty hard, and the songs are more memorable than before. But it still overflows with cheese and I am on a diet. The songs are never very complex, and even with all their progressive days behind them, they still manage to be needlessly indulgent. Fooling yourself tries to be bombastic and theatrical, but isn't more than a juxtaposed and disjointed collection of melodies. And the lyrics attack big business, and commercial success. Superstars is the next lovely track, that ceases to amaze. At least the melodies and singing is a notch higher than anything else they ever did. But, they are too obsessed with commercial success. Did Styx ever even achieve such mass success, or are they fakin' it? I'd assuredly say the latter. Well, Come Sail Away did boost them pretty high up on the scale. I hate scales, and Styx is overweight. You need to go on a diet, too. This song is about as honest as a car salesman. It is still a pretty tune, and the singing is karaoke material if ever I heard. Not convincing, Styx. Aw, I have to admit, I do like this song quite a lot. It is a fine track, and arguably the album's high point. This album is far from terrible, it is just nothing more than an average arena rock album. Miss America tries to heavy things up, and succeeds, but still isn't very interesting. Another solid track, that fades into obscurity after a while. Too bad they attack commercial success, again! Yeah, yeah, I hate big business, too. Screw yourself, you lousy sell ou... I mean, play on, boys! Castle Walls is somewhat pretty. No, those synths aren't good, and yes, it is too long. But it still sounds alright. Sure enough, nothing on this album is utterly bereft of melody. And I quite like some of it, but it is not perfect, and it isn't complex. 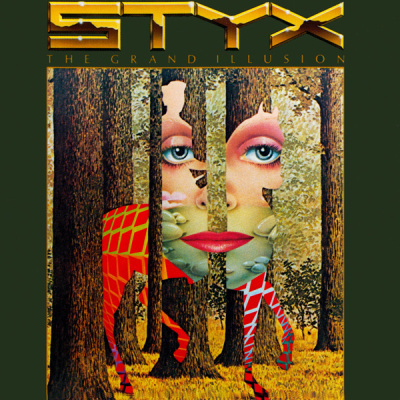 Grand Finale recalls the Title Track, and I like the theatrics (which they finally do a decent job on) but this is Styx! And I feel sick. But at least I am warm in my mediocre arena rock. Styx were never masters of the craft. But this is arguably their peak, which is an ant hill in a deep grave, mind you. They can play decently, and the lyrics aren't abysmal, but this is not a mind blowing experience. At least not in the positive way. Well, unless your expectations for Styx were even lower than mine. Worst Song - Castle Walls and Miss America are almost filler, really.